Mercedes-AMG is now a fully owned subsidiary of DaimlerChrysler, primarily engaged in designing high-performance road-legal luxury vehicles. AMG started its journey as a separate company in 1967 for developing racing engines. 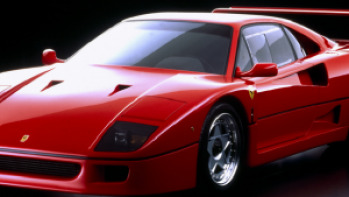 In 1990s, it became famous as developer and dealer of modified high-performance Mercedes cars. 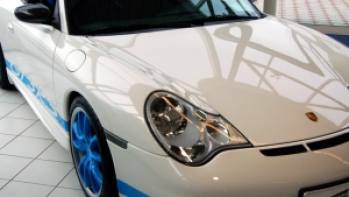 Later, it sold managerial stake to DaimlerChrysler and company was renamed as Mercedes-AMG. Mercedes launched CLS class as executive sedan in 2004. 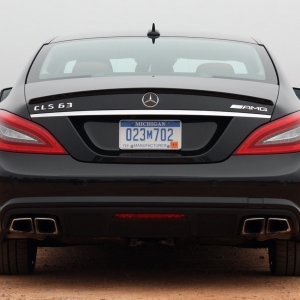 CLS63 AMG is a derivative model on CLS class, launched in 2011. 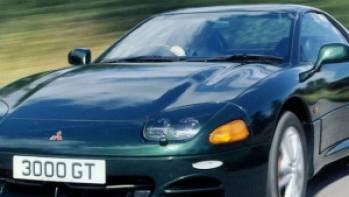 It’s still in-production and is considered as one of the rare-bred luxury vehicles with pure racing DNA. 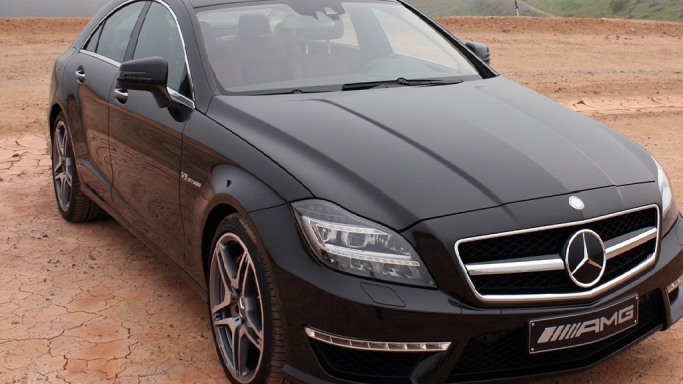 Priced at around $94,000, CLS63 AMG is surely as expensive as any other AMG cars. 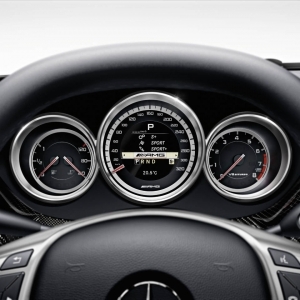 It complies all the yardsticks - stability, safety, driving pleasure and in-car comfort - of an AMG vehicle. Just to match exterior sportiness, AMG has packed interior with utmost luxury and comfort. As coupe, it offers 2+2 seating. Upholstery is completed with nappa leather with elegant cross stitching. Control panel sports piano styled elements. For long hour driving comfort and stable seating, CLS63 sports Recaro racing seats with exceptionally adjustable front row seats. Triple-spoke steering wheel comes with perforated leather cover for the most comfortable grip. AMG offers CLS63 in 3 interior color options – black, almond beige and alpaca grey. In the middle of the central panel, a 3D TFT display allows selection of different driving modes and in-cabin comfort features. For safety, you get adaptive dual stage airbags with knee airbag for driver-side and full length curtain airbags and side airbags. Besides, CLS63 also sports dual-stage electronic stability control, a roll-over sensor, a predictive occupant protection system, night security illumination and engine-immobilizer. 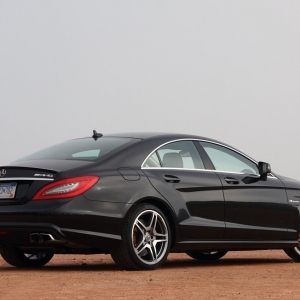 As an executive coupe, CLS63 sports superbly designed exterior. 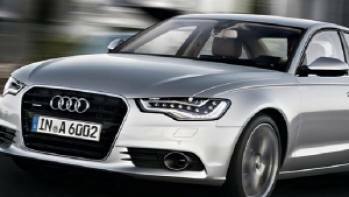 All LED headlamps are surely the most eye-catching factor along with front spoiler. Contoured roofline offers extra head-room inside the cabin. From rear, the most appealing feature is the chrome dual exhausts, black diffuser, wrap-around tail lamps and crossover-like short rear boot. Overall aerodynamics is race-worthy. Just like AMG cars, CLS63 comes with 5-spoke alloy wheels. 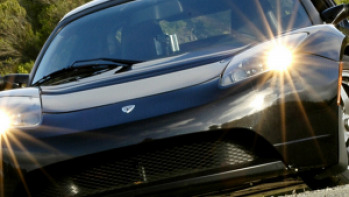 The car has its share of carbon fiber to keep the weight low without lacking sturdiness. Dimension-wise, CLS63 is 201.02 inches long, 73.7 inches wide and 56.2 inches high on a wheelbase of 116.3 inches. 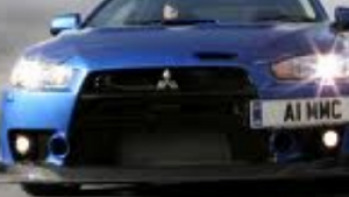 Curb weight of the car is 4806 pounds.